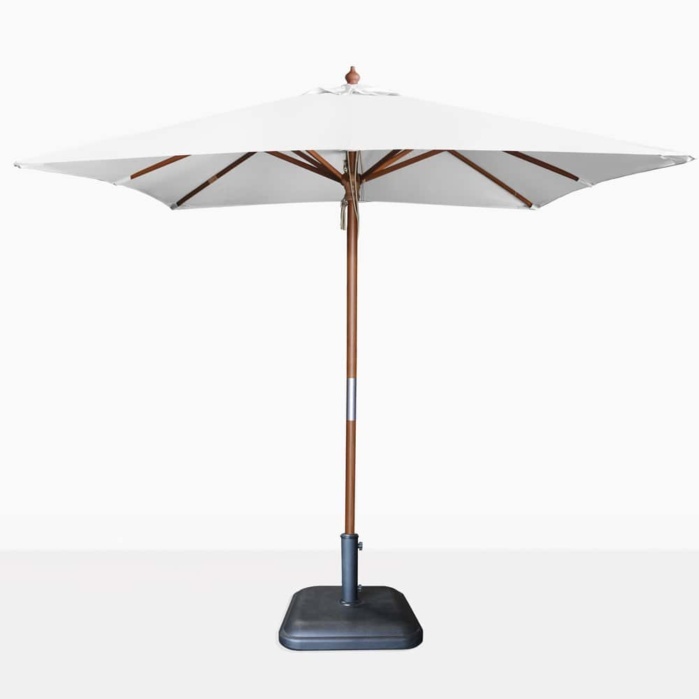 Provide a shady and cool place to rest in your backyard space with the Dixon Market Umbrella. It’s modern square shape, yet classic wooden pole is the perfect design for any style. Its bright white canopy is fresh and summery looking. Use it for relaxing poolside or to provide shade while dining outdoors. Lie back on your favorite sun lounger and relax under the functional Dixon Patio Umbrella. It has an easy to use pulley system that assists in opening and closing the canopy. Be sure to close the umbrella when not in use. The umbrella base shown is not included in the price. Please call or email us today to select an outdoor umbrella base that will work for you and your outdoor space. The Dixon Market Umbrella is available in 2 sizes. Outdoor umbrellas are great finishing touches on your outdoor living space. The provide shade and accent the furniture you place it with. Teak Warehouse offers a number of different styles of umbrellas. Call us today or email us if you have questions.